The story begins in Boston. Nina Revskaya was elderly and frail, but once she had been a prima ballerina with the Bolshoi Ballet. She had decided to auction her jewellery collection to raise funds for the Boston Ballet Foundation, and that was stirring up memories. Memories of life of Russia, of the days when she rose to success, when she fell in love and married the poet, Viktor Elsin. Many memories she would rather forget, and memories she did certainly not want to share. Young associate Drew Brooks has been charged with finding the story behind the jewels, the story of Nina’s life, by Beller’s Auction House. To find the stories, the extra colour, that will make the jewels even more valuable. And it is clear that there are stories. Professor Grigori Solodin provided another piece of jewellery for the sale: an amber necklace that clearly matched a bracelet and earrings from Nina’s collection. Was there a connection between the ballerina and the professor? How, and why, were the amber jewels separated? Grigori doesn’t know. Nina may know, but she says nothing. And Drew wants to know. The story is set up and constructed so cleverly, and it moves seamlessly between past and present, between Russia and America. The stories set in Russia were wonderful. They told of a ballerina’s rise to the very top of her profession. Of her love and marriage. Of her network of friends. And of life under Stalin, in a world where you were never sure who you could trust, where even the smallest sign of dissent could lead to imprisonment, exile, or even death. The American story was not quite so strong, and maybe a little contrived in places, but it was still interesting. The balance felt right. The writing was elegant; the storytelling was wonderfully subtle, and yet it never lost it grip. This wasn’t a story that pulled me in, but a story that I had to watch, fascinated. In the end they were all answered. And, although some extraordinary things happened, the answers rang true. The ending came suddenly: it was a little rushed, and I wished that it had been just a little more subtle. But it was the right ending. Russian Winter mixes ballet, jewellery, human stories and Russian history to wonderful effect. It is an intriguing – and very readable – debut novel. 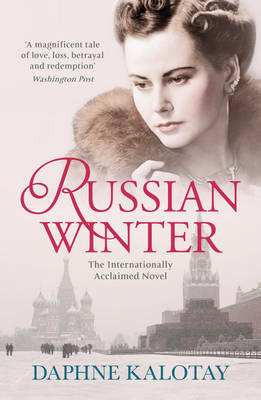 If you’d like to find out more about Daphne and Russian Winter, you can visit her website and her Facebook page. A reading group guide is also available. I read this book as part of a blog tour organised by TLC Book Tours. Don’t miss the other stops on the tour to see what other readers thought of Russian Winter. Sounds wonderful to me. I’m fascinated with that time period of Russian history. It is a fascinating period, and a lovely book. Reading this review on a cold snowy train to work with a week’s holiday around the corner makes we want to snuggle down & read it. Sounds perfect – especially now we have weather blown in from Russia! Read a lt about this book, as it is featuring on lts of my favourite blogs at the moment. A lovely review. I’m a huge fan of stories set in Russia and the Soviet Union so this book definitely appeals to me. Thanks for being a part of the tour. I’m featuring your review on TLC’s Facebook page today. I’m glad you liked it! I can’t even imagine what it was like to live in Russia under Stalin. It was a fascinating period to read about, and informative without being heavy going. The stories were well balanced. I absolutely loved this one and thought of how hard it would have been to grow up in Russia! It was your review that pushed this book on to my wishlist Staci. So, thank you!